One of our instructors, Monica, teaching binding. 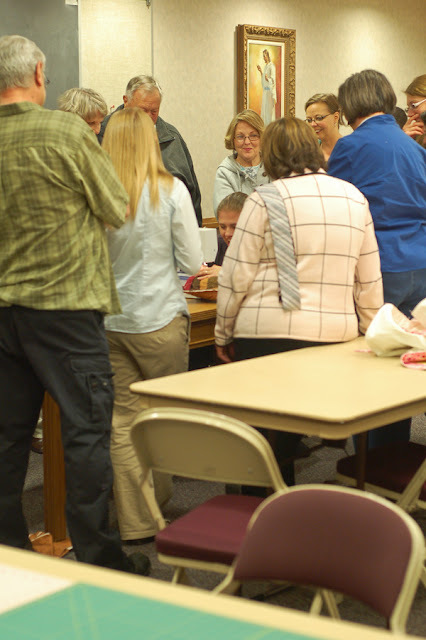 I approached three very experienced quilters to "team teach" the class, so no one teacher would become overwhelmed. We broke the class into a three part series and each teacher was responsible for one part. They were all so enthusiastic and did an awesome job! We started by getting together to throw around ideas and choose a simple project. We decided a table runner was doable and would teach all the basics of quilting. 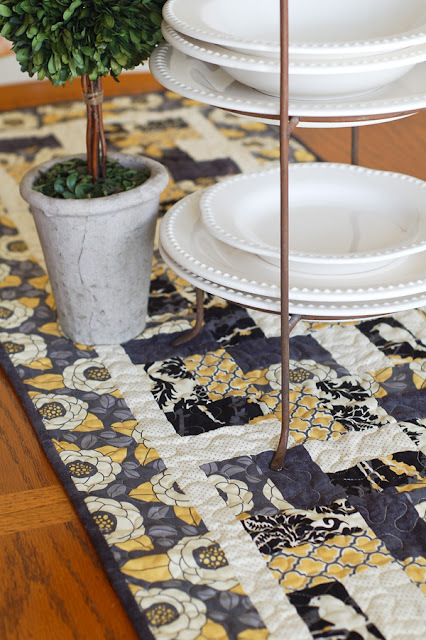 Monica designed a pattern and instructions for a runner that included a border. 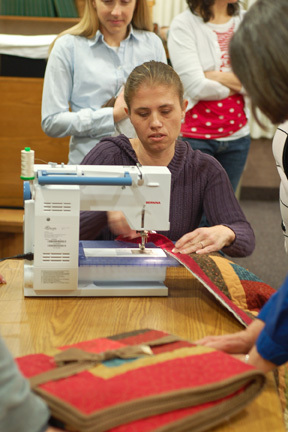 (She teaches at American Quilting in Orem and has designed her own quilts.) Each teacher then took the instructions and made a table runner. It was nice because they all looked so different and appealed to a variety of sisters. Roxy sewing on her binding. I love that "vintage" machine! Works like a charm. We sent out the details via e-mail and in the RS binders, along with a supply list for the class. Ruth has a gift for choosing fabrics, so she typed up a great handout on fabric selection that was also included. I arranged to have our instructors available at a local quilt shop--Just Sew in Highland--one Saturday morning to help sisters choose fabrics and answer questions. The shop gave our ward members a discount on supplies purchased for the class. 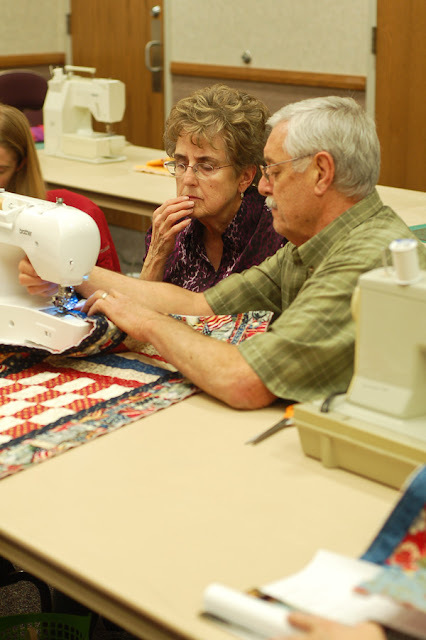 The two hour classes were divided up according to the quilting process. Each instructor was responsible for the demonstration and instruction--along with any handouts--for her week. The other two teachers were available to assist. We provided a few bowls of munchies (pretzels, M&M's) on a table for snacking. We couldn't possibly quilt without chocolate! We have very supportive brethren. Two even made their own runners! We encouraged sisters who weren't taking the beginning class, to join us and work on other quilting or sewing projects, or a quilt we made for a special sister in our ward who was in an accident and bedridden. It was so rewarding for me to see so many sisters learn a new skill. 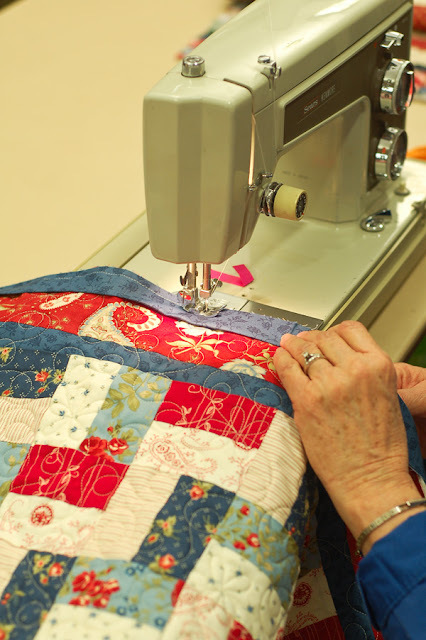 As a result of the class, there have been break off groups who have worked on other quilting projects and one of the instructors, Ruth, will now be heading up a monthly quilting group/class. Very inspiring! I wish I was in your ward to benefit from such talent! !